very close. except what I was talking about is exactly opposite. your punch will look kind of like a countersink with a pilot. the die body will have a straight hole the size of your jacket. its bottom has to be adjustable so you can set the desired length of jacket you want. the pilot on the punch aligns every thing and the countersink part cuts it off flush with the top of the die. you do not want to debur the Id of your Die body as this sharp corner is what actually will cut the jacket give yourself a couple thousandths clearance between die Id and jacket OD so everything slides in easily. Oh yea Congrats on the Deer. Give him a big ole pat on the back. youns will be eating mighty good for a spell. Ok, I see where you are going now.. Thanks a mint! Thanks for all the info Reload - the light bulb finally came on lol. I can definately see this one being a very handy addition to have. I envy you guys with the tooling to make your own dies. Sounds like a neat project but I will leave it to you guys. I have enough projects for now, but will like to hear how the tubing project goes. Not sure what you call close the LE range that everyone uses including the Reserve components is about an hour and a half drive from my place each way. For the 5 counties on this side of the mountains (our counties are much larger generally than the ones out south) there are only 2 indoor ranges left. Most public ranges closed after the lead ban went into law, and the DNR has been closing the outdoor ranges as fast as they can due to "public nuisance" and lack of funding. Of the unregulated ranges only one is left and only one county-run regulated and manned outdoor range is left although the hours have been cut significantly. The LE and Reserve components shoot at the county-run outdoor range, and I love it when the Squid Reservists shoot there because they never take home the brass. The Squids always leave piles of Lake City 5.56 and 7.62 NATO. The 9mm they leave is a mix though. Its hard to tell the stuff the Squids leave from the 9mm crap other shooters leave. I have noticed more of the "mouse gun" calibers at the range when I dumpster dive. With the popularity of the smaller guns like the Ruger LCP, we are seeing a lot more .380 and .32 ACP in the bin. The Coasties are shooting .40 S&W now, and they do not pick up their brass either. The LE folks have to shoot shotgun out doors now because any non-coated exposed lead (shot gun pellets) cannot be shot indoors. Something about the amount of lead vapor in the air when the exposed lead impacts the steel back stop. Its nice the LE guys leave the brass, but a lot of it I have noticed is steel cased Berdan primed Euro crap. I wish the LE folks would buy American, but I understand shrinking budget. I have heard of folks swaging the steel cased Berdan primed stuff to use as bullets, not sure I would want to do that. I see a lot of the aluminum .40 S&W Blazer stuff at the range. Not sure who is shooting it, but they shoot a lot of it or have several shooters. There are always lots of Berdan primed Euro crap, and former Comm Block brass in the scrap metal bin. Rather than see it go to scrap metal would be nice if someone could reuse it. now if you just could make some 180 gr. hp would do fine in my 35 rem. Winchester cases, CCI primers, 125 gr home made projectile, 4.4 grains Titegroup, 1.45 OAL. 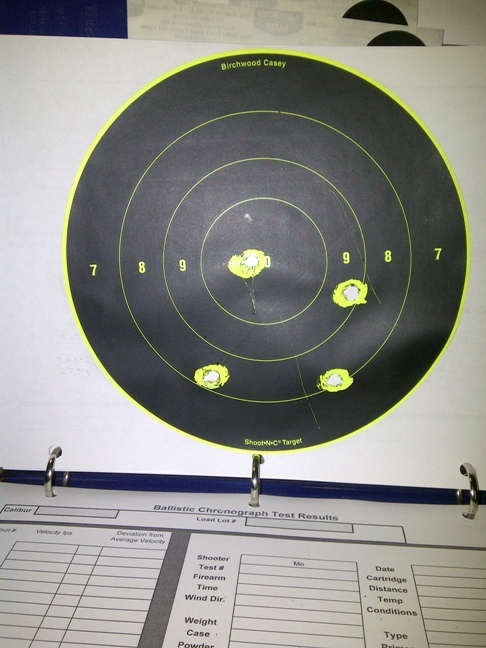 Target was 25 ft. S&W 38 SPL model 10. The second setup was exactly the same except I loaded these with 5.0 gr of Uniique. This powder is old. The third shot wasn't recorded by the chrony for whatever reason, and the 5th shot was a dud. It came out of the barrell but did not register on the chrony and did not impact the target. Thanks Reload. That first shot was a doozy lol! I was sweating like a dog crapping perssimon seeds not knowing what to expect. I have no doubt that your results will be at least as good if not better! What caliber dies are you making? I'll definately keep an eye open for the results.. I dug some of them out of the old dirt filled cooler and this is what they looked like. Not very much expansion but penetrated from 6 to 8 inches. The one on the left is a factory +P projectile that was from a couple of months ago for comparison. I will be making .355/.357 and .308 I have my draw dies and punches made and I have my round over die made I just need to make an assortment of Different length punches to hold the jacket in the round over die. Since I dont have any 9mm and 357 jacketed dies yet I will make .308s first. ..
Are you using pure lead? you might get better expansion with pure PB. Cool, I'm anxious to see how they work for you. If I get to where I'm satisfied these, I may try a set for the 45 next. The lead is a general mix, mostly WW but some battery posts have been added to the mix here and there. I don't have a hardness tester but from all indications this batch is up fairly high on the brinell hardness scale.. Trying to get my act together on my Tubing jackets. I cut 3/8 OD copper tubing to length. 1 1/16 Run it through my round over die. No problems. I do about 20 of them I get ready to start drawing them down (making 30 Caliber) put in my .355 ring die and try to draw them down .. Pop the end through. Ok so I figure I need to Anneal. I fire up my torch and anneal them all then back at it get them all through the first draw. now they are all .355 on on to the second draw ... Pop right through the end. WTF... ok anneal again and start to draw the .355s down to .303 I manage to get about 5 good jackets drawn out of 20 any ideas? LOL.. mine have started doing the same thing for some crazy reason! I am getting the same results - punching out the ends. I wasn't too sure about the punch configuration because I made it with a 1 degree taper and am not sure if that is the best thing or not at this point. Sometimes I will get 2 out of 5 and sometimes none. I tried rounding the face of the punch to knock off the sharp edge but that didn't help, and I've tried leaving it at a sharp(er) edge but no better results. I have made 40 or 50 bullets so I thought that maybe the punch had some funky wear on it. In the process now of making another punch without the taper to see how that works. I opened up a couple of the drawing dies to where it was reducing only 5 thou or so in combination with extra annealing and that seemed to help some. The tubing starts out at .375 OD - anneal - and my first draw die pulls it down to .370 - second draw is down to .365 - next draw is to .357 but this is where I usually punch them out. The ones that I manage to get sized down will punch out when I put them in the core seating die to flatten out the bottom. interesting maybe we have some bad tubing? I did find this at a place called OnlineMetals.com. They have the copper pipe in small sizes. They offer it in C101 alloy and C122 alloy. No idea what the difference is or which one would be better for what we're trying to do with it. talking to some metallurgists here at work (Boeing) they are suggesting I try going to a plumbing supply house and trying Hard Drawn copper tube Type L they said its probably a little tougher alloy than the soft stuff at Lowes Homedepot. We shall see. OK success. still had a few pop through but lots better. Yesterday and then again today I had some free time to spend in my Man CAVE lol. its still soft tubing so I expect to have even better results when I get some hard tubing. I think there were a lot of things going on. First I think I needed better lube and use more of it. While I didnt have any jackets stick on my punches I did pop through the bottom of the jackets and had them stick in the draw die. I did stick a couple in my round over die but not too bad. LOTS AND LOTS OF LUBE. Ok another thing that is critical is cut square and to the same exact length. Also the most trouble i was having was I was putting too much pressrue in the round over die and was micro cracking the tubing at the bend radius. So i backed off on that till I had just closed the end enough for my extraction pin to catch it and push it out. got them all rolled over then I started Drawing them I did not anneal until after the first draw. I ran them all through the first step down to .350 washed them all up in dish soap and rinsed them then into MEK to get any oil off of them and started annealing them red hot quench in cold water. Then through the .303 draw die. lost about 15 out of 100 I consider that pretty good as I had a lot of them with too much pressure on the round over. so got them all drawn and then into the core seat die and flattened the ends ... Another bath in MEK and core seat time. I have some pretty sweet looking 8s 180gr open tips to shoot now. I know they will not be as accurate as J4 jackets but should do ok for hunting.